High ranking source in Prime Minister's Office tells Arutz Sheva Netanyahu's statement in Davos did not just refer to Jordan Valley. 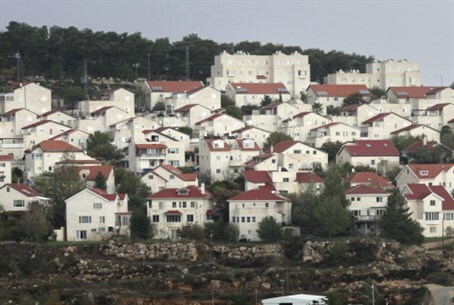 In an exclusive interview Sunday, a senior source within the Prime Minister's Office, who spoke to Arutz Sheva on condition of anonymity, said that when Prime Minister Binyamin Netanyahu stated in Davos this past week that "I do not intend to evacuate any settlements or uproot a single Israeli," he meant "not just settlements and Israelis in the Jordan Valley, but any settlements and any Israelis." This clarification represents a dramatic official confirmation of the inclusion by Netanyahu of all the existing settlements in Judea and Samaria, and east Jerusalem, in any future map of Israel. Since the Prime Minister had responded to a specific question concerning the Jordan Valley in Davos, many news outlets had erroneously concluded that PM Netanyahu had limited his response to only the Israeli Jordan Valley settlements. Recent reports indicated that Kerry was pushing the sides to agree to a deal that involves a slow transition from IDF patrols over the region to PA forces, with an international presence. IDF drones would also be deployed over the area, as a means of gathering information about potential terrorist activity. Israel has reportedly rejected this idea, explaining that drones are not a suitable replacement for the presence of Israeli troops in the region.